A complete and balanced electrolyte formula to help promote optimal hydration, especially after excessive sweating or frequent urination. It contains potassium, sodium, chloride and magnesium, the main electrolytes found in the body. D-ribose is included because of its importance in healthy cardiac function, exercise recovery and energy production, while taurine helps to regulate cellular electrolyte flow. 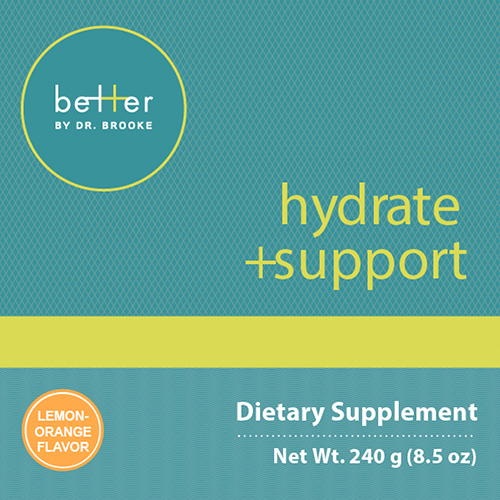 Hydrate+support also contains vitamin C, along with the synergistic compounds quercetin and citrus bioflavonoids. Vitamin C supports the cardiovascular system by helping to build healthy collagen, which is one of the main structural components of blood vessels. Mix one serving of hydrate+support into water 1-2 x daily or as recommended by your provider. This product has a delicious natural lemon-orange flavor, is sugar-free, and gets its sweetness from a small amount of the natural herb stevia. Made with non-GMO ingredients. Recommended Use: As a dietary supplement, mix 8 grams (approx. two teaspoons) in 10-12 ounces of water per day, or as directed by your health care practitioner.